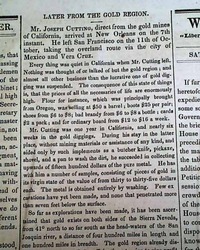 NEW-YORK SEMI-WEEKLY TRIBUNE, November 4, 1848 The back page is an article "From California - Counter Revolution at Mazatlan" which mentions the increase of excitement of the gold rush. 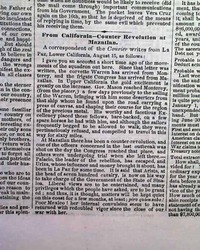 Also within the article is the counter-revolution at Mazatlan and the escape of the rebellion leader. 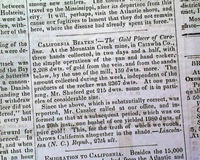 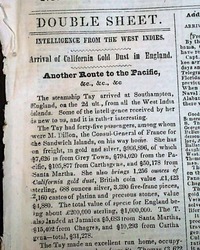 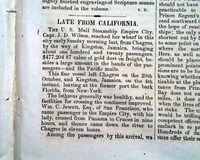 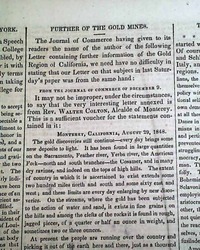 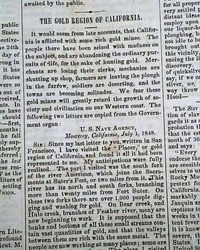 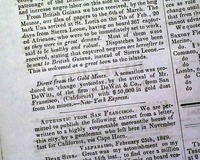 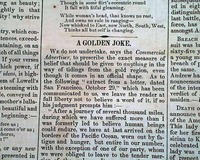 California Gold Rush reports from 1848 are rather rare but we've found some through the years, such as this one. 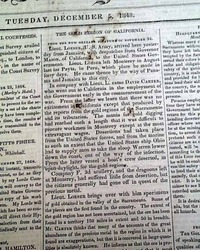 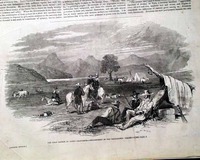 THE ILLUSTRATED LONDON NEWS, England, Feb. 10, 1849 The front page has a nice print captioned: "The Gold Region of Upper California--Encampment in the Sacramento Valley" which has a related article on pages 3 & 4: "The Gold Seekers Of California", which takes over a full column of text. 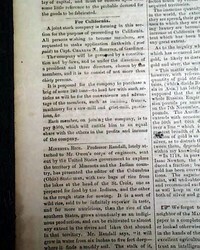 THE FLORIDIAN & JOURNAL, Tallahassee, Florida, March 31, 1849 A nice & rare opportunity for a very early newspaper from the capital of Florida. 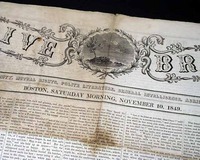 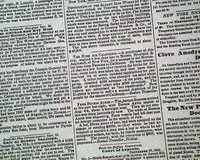 Very rarely are we able to find antebellum Florida newspapers, particularly from the capital. 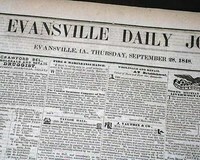 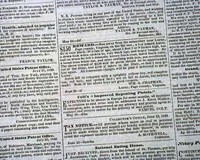 Formatted much like other newspapers of the day with various news reports both local & national, and a wealth of ads as well. 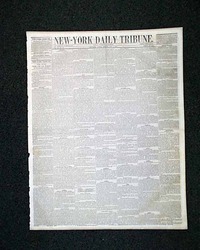 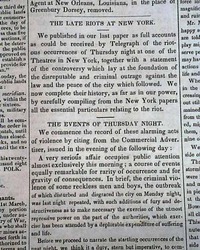 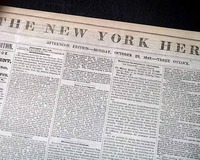 Page 3 has a follow-up report on the Astor Place Riot (see hyperlink) headed: "The Late Riots at New York" and "The Events of Thursday Night", the report taking 1 1/2 columns and carrying over to take most of the back page. 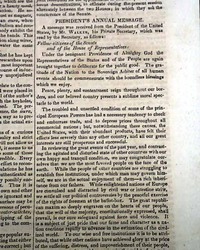 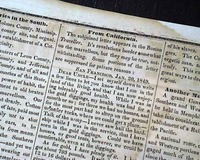 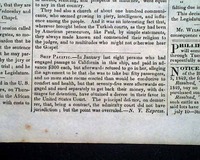 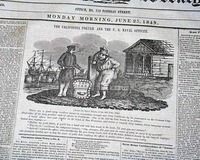 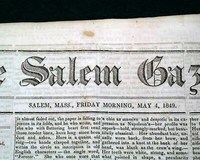 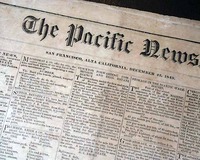 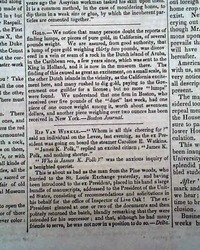 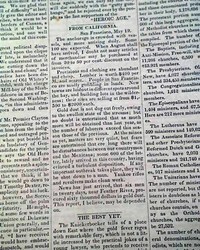 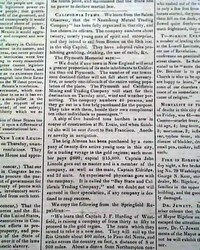 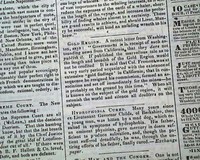 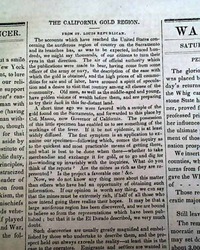 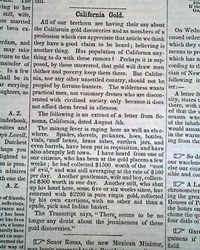 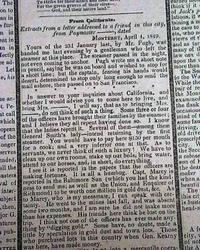 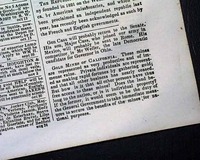 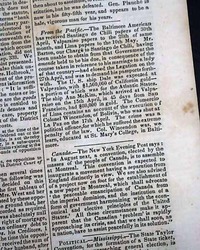 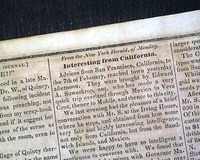 Page 3 has: "California News" which has some comments concerning the Gold Rush, followed by: "Death of Ex-President Polk" (see photos). 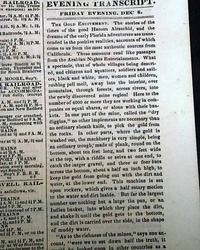 Four pages, never bound nor trimmed, great condition. 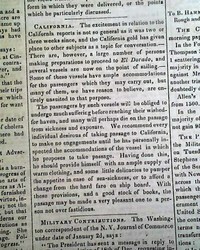 NATIONAL INTELLIGENCER, Washington, D.C., July 10, 1849 The third page carries a report "Ship Pacific" in which the ship had received monies to in advance to take passages to California for $300 with a limit of fifty passengers, but had sold to seventy-five without having proper state room space and were taken to court. 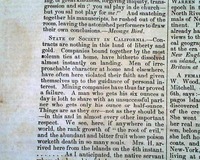 THE HOME JOURNAL, New York, Sept. 1, 1849 Page 3 has: "State of Society in California" is an interesting article on the loss of ethics upon arrival at the gold fields (see). 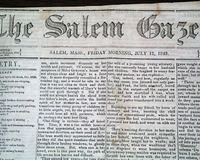 Four pages, minor foxing, nice condition. 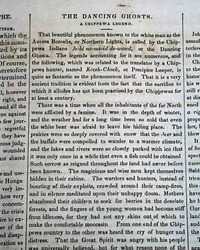 NATIONAL INTELLIGENCER, Washington, September 11, 1849 Page three has the interesting Chippewa legend, "The Dancing Ghosts", which centers on their response to the Northern Lights phenomenon. 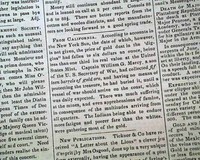 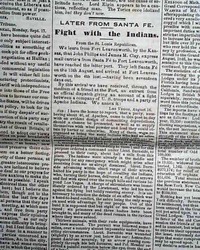 The issue also contains much on the issue of slavery and Native Americans, as well as reports related to Westward Expansion. 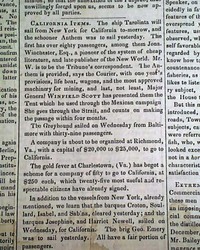 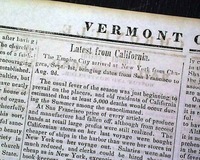 NEW YORK COMMERCIAL ADVERTISER, Sept. 29, 1849 Page 2 has a brief article headed: "The Rush For California" which reports on the quick sale of tickets for boats to California with some price scalping as well. 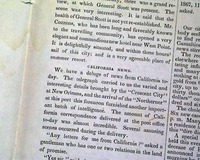 It ends: "...New England is about to suffer a second depletion of her people for the shores of California." 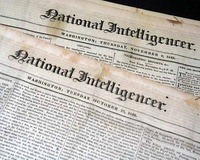 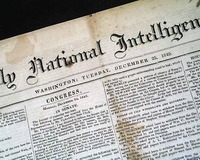 DAILY NATIONAL INTELLIGENCER, Washington, D.C., Dec. 25, 1849 Most of the ftpg. 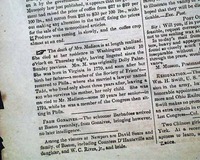 is taken up with reports from "Congress" including several mention of "...Mr. Davis, of Mississippi..." which was Jefferson Davis, who would become the President of the Confederacy.